We will be celebrating this weekend under the GIANT tent to be erected in our lower parking lots. It will have a similar feel to our 150th anniversary, but this weekend is all about the ringing in of Spring! 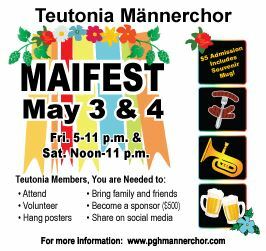 See the Maifest event page to get details about bands and activities! Our Fests for members, guests and the public for the 2019 season. Make sure to mark you calendar now so that you don't miss out on the fun. Deutschtown Musicfest: (a sponsored event) Friday July 12th and Saturday July 13th we are participating in Pittsburgh’s best music fest – Music in our Biergarten, details to follow. Oktoberfest: Friday and Saturday September 6 and 7 – Friday 5PM till 11PM and Saturday Noon to 11 PM With the big tent, food and bands. Tuesday 4 p.m. – 11 p.m.
Thurs. 11 a.m. – 11 p.m.
Friday – 11 a.m. – 1 a.m.